With an International airport, the city of Daegu attracts business and adventures travellers alike. You can explore Apsan Park, Donghwasa or the Daegu Art Museum. From historical sites to modern marvels like E-World 83 Tower, Daegu has it all. South Korea is an East Asian country that on one side, boasts iconic cities like Seoul and Busan, and on the other, has beautiful countryside full of colorful cherry trees. Visit to explore many Ancient Buddhist temples and other historic places. Below expectations - Room: Bed was uncomfortable, and furniture was run down. During my first night I had to call front desk because the AC unit did not work and the response I received is either get a fan or open the window. I was facing one of the mains streets of Deagu. - Gym open until 6 am. I'm use to fitness center that is open for guess use since much earlier as business travelers we are under a fix schedule due to our shuttle. - Breakfast food was sufficient. For the price you charge me I will say your breakfast was just scratching expectations. In summary for over 150000 KWN a night, I was expecting much better accommodations, service and food. I think that your service will match a 3 start hotel, I will not have a problem if your pricing match that. Room was good, but I was terribly disappointed with your food quality at The Square Restaurant. I tried both dinner and breakfast buffet. The food was cold, had been out quite a while, not fresh, not tasty, steak was tough... Unless you can drastically improve the quality of your meal, I would not stay there anymore. Always a good experience and I love their breakfast. I always have a wonderful stay at Novotel in Daegu. The staff are incredibly nice and professional. The rooms are well appointed. The best hotel in Daegu!!! Location ,rooms, foods especially the services were great. It is indeed the best hotel in Deagu city. I will return whenever I have time to visit Daegu. Thank you Front team, you guys rock! Very pleasant overall. Staff members at the front desk were so kind and particularly Mary was exceptional. Good place to stay, clean and quiet, good breakfast. The last time I stayed here was about 8 years ago. It has fallen into disrepair. Elevators not working, everything looking old. Nice hotel, excellent breakfast. Only minor point: when I arrived in my room the thermostat was set at 26 degrees and my room was very warm. Windows could not be opend so it remained too warm for the rest of my stay. 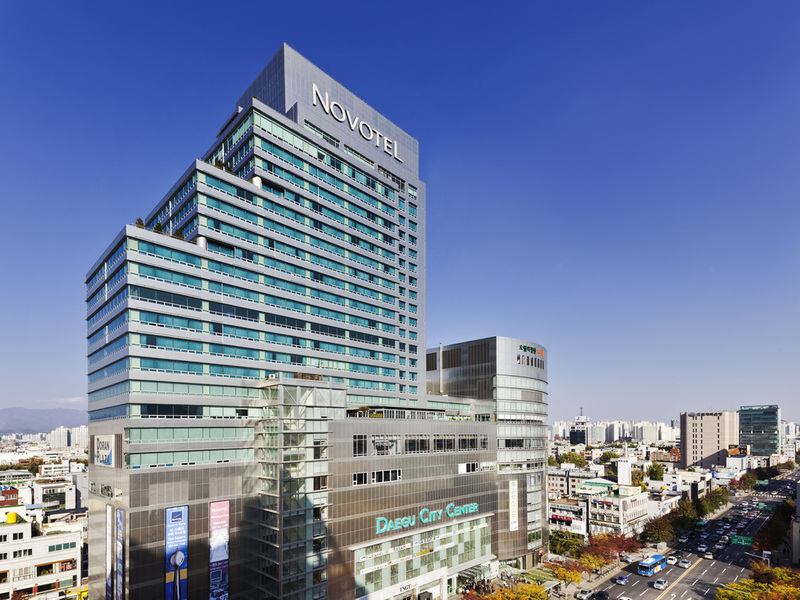 I have been frequently using a stay in Novotel daegu ambassodor i stay almost every weekend and sometimes in the Fridays for a almost a year due to my business in daegu. we check in either my name or Mr. Baek. i have been unsatisfied with the cleanliness of the towels. since from a few months. it stinks like a mop. and i can barely wash my face with it. i cant be bothered to ask for new towels and i let my face dry by itself and just use the stinky towels in my body. please make sure to do something about this. and i hope there is any more benefits to the frequent visitor and users. we have been checking in almost every weekends and there seems no beneficial to us. The heat was way too high and mostly 80 degrees Fahrenheit in the room. One night the nice girl at the front desk offered to come to open my window and that helped a bit. Clean, affordable and awesome staff. Severices have not changed and excellence is always a constant every time I stay. See you again. Modern, comfortable and clean hotel with friendly staff. Convenient and clean, staff is helpful. Location is very convenient. The good... fantastic breakfast buffet layout and seating with a view. Great location in the middle of the city. Staff were very polite. The bad... could not control the heat, the room was terribly hot. The shower overall was nice but very little water flow. TV was not easy to operate, had to call front desk to figure out how to change the channel! Friendly and accomodating staff. Very clean and nice room. I needed to stay an extra two days due to a medical injury. The staff was friendly and able to book my extra two nights over the phone. Very nice hotel and staff. The person who cleaned our room was also amazing. She worked around us and was really nice and helpful.